What dish is more Cinco De Mayo then tacos? Amiright?! Since that is the case it seemed only approproate that today we bring you not one, but two tasty taco recipes that are super easy to whip up and healthy too. So grab your margarita and lets get cookin. Season your tilapia with pepper and garlic powder. Cook over medium heat in a frying pan until cooked through. 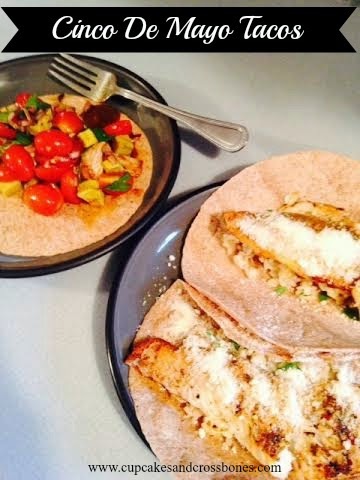 Lay cooked fish on 1 flour tortilla. Top with cherry/balsamic mixture. Garnish with cilantro. Enjoy! Season 1 piece of tilapia with pepper and garlic powder. Cook over med heat in frying pan until cooked through. Cook 1 cup brown rice according to package. Lay brown rice on tortilla. Place your cooked fish on top of brown rice and sprinkle with Parmesan cheese. Add a dash of hot sauce for extra spice. What is on your menu this Cino De Mayo? PS Don't forget to check out yesterday's post to see what exciting stuff we have heading your way! PSS For more tasty healthy recipes head over HERE and follow/get in touch with the Cupcakes and Crossbones personal fitness motivator and coach, Mel. I don't do fish but I could totally swap for chicken! Sounds delish. i am for sure celebrating with a Margarita and some tacos or a taco bowl! Fiesta!! Absolutely! Get it gurl, You know I'll be celebrating! Avocado anything is always a good idea! I'm a huge fan of tacos and a fan of fish tacos specifically! Same here! Can't get enough! We're having fish tacos tonight, too!! I'm going to have to give your version a try soon - it sounds delicious! one of my fave dishes!